I had an amazing time in Calcutta last week doing the 'Art of Living' Yes+ course. If you ever get an opportunity to do the course, do not hesitate - just do it. Trust me, I'm the last person you'd find recommending you to be bogged down by a week of 'religious teachings' and the same. 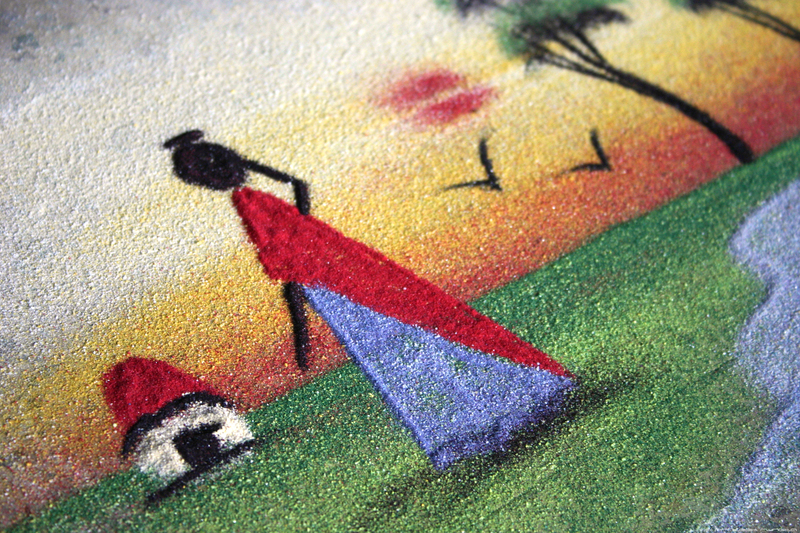 This by the way was shot at a Rangoli class that's been happening out here in Chakulia. Update: For those of you who'd like to sport the above as your wallpaper, here's a 2560x1707 version. Rungta, I don't intend to give you any airs about yourself but you really are a most gifted photographer. Here's another ideal desktop wallpaper. Send me a high res? okkey what's the surface here? I've uploaded a hi-res version so grab it to satisfy your pixel needs. Its a mixture of mostly coarse material, one of which is crushed marble. @Nag: I'd also gotten fed up with airports. @Varenya: More fans are always a good thing ;). hmm........it reminded me of the beginnig of the movie 'The English Patient'..dont know if you have watched it to actually relate to it!...it's nice!!!! a reallly pretty pic there!